More than two decades after its inception, indie rock band Sebadoh is back on tour – this time in Europe – after a reissue of what is arguably the band’s best record. 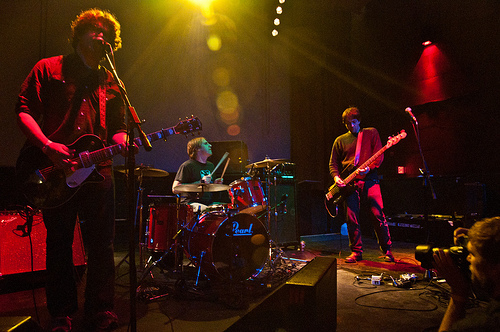 Fans can expect the set list to fall evenly inline with these recent events: earlier this year, Sebadoh reissued 1994’s “Bakesale,” with plans for a reissue of 1996’s “Harmacy” in the coming months. As a result, the emphasis on this tour will naturally be songs from those albums. Additionally, he admitted there is a consistency to the order for a few different reasons. D’Amico, who is perhaps most well-known for his role as the drummer of the Fiery Furnaces, came to the band via guitarist Jason Loewenstein, who also toured with the Fiery Furnaces. Practicality aside, Barlow said there is also a very real appeal for the band in playing the same thing every night – one that keeps it from getting boring. And because the songs are so familiar to the band, Barlow said that is also makes the live set more enjoyable, both for the audience and the band members. That’s not to say the band didn’t or couldn’t enjoying playing before, but Barlow said there is a level of comfortability he’s found within himself and the music which wasn’t present in the 90s. Back then, he said he was a nervous performer, a trait which sometimes lent itself to manifesting as either aggressiveness or defensiveness. Now that he’s older, Barlow said he no longer is subject to feeling this way. Yet there are always pros and cons to anything, and the exchange in attitude and energy also is accompanied by an exchange in the way feel of the times. Arguably, while things are much more relaxed and fun, they may not be as exciting and new. Referring back to the mid 90s, around the time of the release of “Bakesale,” Barlow said musically, things were happening for him all over, in Sebadoh, Dinosaur Jr. and another project of his, Folk Implosion. Even though those days are behind him, Barlow considers himself lucky to function as a musician in so many capacities – not only in writing but in the performing aspect. Especially now that he’s also a family man, Barlow has found it’s important to have those different options and a certain kind of flexibility to the music he makes. “It’s hard. I’m just working at it. Always evolving. Trying to make it work with my wife and with my family,” he said. Which brings him to what he feels is one of the hardest things about being a musician – particularly now that he is older – and that is striking that balance between a career and a personal life. He also admitted that his life as of late is relatively “kid-centric,” which limits the possibility of seeing much live music or going on extended tours. Yet that will come in handy when Sebadoh takes a break from touring in order to work on new material. This is good news for fans who have been waiting more than a decade for Sebadoh to produce something new. Of course, writing new songs can be scary for the band, particularly because it opens the members up to criticism from fans who have certain expectations, but Barlow is not concerned with this, because he said the validation is still there, and it’s what keeps him going. This entry was posted in Interview and tagged American, Feature, Interview, Sebadoh. Bookmark the permalink.